Dorothy is having trouble reading. Well, she’s not. But she doesn’t like it. And she should, there’s no reason not to. I’ve watched 6 other children learn to read as a homeschool mother. Faith and Abby picked it up from being read to and playing on Starfall. Bede is hyperlexic and could read before he could talk. Gilbert also went the Starfall route. Trixie was the first child I taught, with Bob books and mother-led Starfall. Gloria I also taught, but she was very reluctant. I don’t really remember what we did, but it was a lot and it took much longer than the others. There were tears. But today she is my most avid reader among the kids. Dorothy is like Gloria. She’s been doing Reading Eggs, but she kind of drags her feet and makes a face when I tell her to do it. And she fully brings the misery when I say she’s going to read to me. So! I’m starting over. We did the first lesson from the above book, Teach Your Child to Read in 100 Easy Lessons. And do you know what, she laughed during the lesson! I’m sold. I forgot about the cute Usborne phonics readers where the proficient reader reads the harder text and the newb reads the easier bit on each page. Much more fun because you get a good story instead of the odd ones that come up in most CVC books. I have a few of them (somewhere?) and I went to buy the rest and found this My First Reading Library set for just a little more, so I got it instead. I’ll update in a week or so after Dorothy’s had a chance to settle in. I’m going to blog more regularly about our school days. I love to look back on it later, and it might be helpful to someone doing the same things I am at some point. Dorothy; Bookshark Level Pre-K with K readers. Monday: Dorothy read two books from Fun Tales. She starts with deep trepidation which switches to tears, then sniffles, then smiles. Every time the unpleasant reaction gets shorter. I had the same experience with Gloria, years ago. I asked her (Gloria) if she felt emotionally scarred or resentful about learning to read and she said she barely remembers it, and not as a bad thing. Hope Do is the same! Gloria reads voraciously now. Trixie woke up, started her math, made many frustrated noises, shed a few tears herself, then went back to bed and slept for another two hours. Woke up and said, “I think I can do my work now.” And did, went right through all of it. Sean and Dorothy read the read-alouds at bedtime. They’re on The Berenstain Bears Big Book of Science and Nature. She likes it as much as I did when I was her age. Heart eyes. Tuesday: I got a tooth pulled, ow. I expected the kids to take the day as their Fifth Day, but only Gil did. Gloria and Trixie got out my Instructor’s Guides while I was out and did all their stuff. I was impressed. I shirked a bit myself, though. I couldn’t manage our read-aloud, The Shakespeare Stealer, because my mouth hurt! Day off for me. Wednesday: Gloria was the only one up before 9, a rarity. I roused the rest and we were off. Dorothy is using Reading Eggs along with my instruction, which she also at first resists then likes. Kids. I changed something this week: science in two days instead of our usual three. Trixie will get days 1 and 2, Gilbert days 3 and 4. It’s laid out so clearly already that it’s easy to break day 3 in two and give half to day 1, half to day 3. Day 4 is experiments, which we don’t do that often, but can easily fit in any day. So this was the first week with the new schedule for science and I liked it. Kids didn’t notice a difference so, yay? Heh. Finally got to read aloud and start Shakespeare Stealer. It’s first-person, which is fun to read aloud because I always feel a little like a noir detective. Thursday: Gil complained that the calculator won’t do fourth roots. I was unsympathetic. Gloria is reading Carry On, Mr. Bowditch by herself, even though it’s scheduled as a read-aloud. She likes it a lot and is a few chapters ahead of the IG. I’ve read it too – if I’m not reading a given book aloud I read it myself so the kids get a book-club style discussion partner. She and I both think it should be called (SPOILER) Carry On, Mr. Bowditch Even Though Everyone You Love Dies. Friday: Gil’s the only one today, since he took Tuesday off. I use the fifth day to look over the kids’ journals that they write in 4x week and to check on their math with Teaching Textbooks. Trixie seems to have a fundamental misunderstanding of division and fractions, unsurprising given that this is her first year with structured math. I’m dialing her back and starting with Division 2 from Math Mammoth, my favorite gap-filler. Fifth day is also my catch-up as well as the kids’, so I read some more Shakespeare Stealer. It’s a good ‘un! I’m looking into the virtual charter school thing. $800 per student per year to use toward education, including extracurriculars like piano or karate! Lots and lots of oversight. Paperwork and meeting requirements from whoever we are given as our teacher liason. Genneral ennui as my children are injected, inspected, detected, infected, neglected, and selected. But did I mention the $800? I haven’t talked to anyone at the school, just other school families. Their opinions vary. I’m going to email the admissions director about what is really required and what is optional. This wouldn’t be for all the kids, most likely Gilbert, Trixie and Gloria. Possibly Abby. And I’d have to get their buy-in, because I’m not doing this unless they are willing to deal with the hoops and red tape. And the work, of course. Right now we do math, the end. High tide ahead – The Hero’s Journey, perhaps more? I have plans for the homeschool year! I’m going with Oak Meadow again. We last used them about 3 or 4 years ago, for the American History year. It went well. I don’t know why I stopped, probably expense? Because it is expensive, no lie. So far I have the teens socked away. 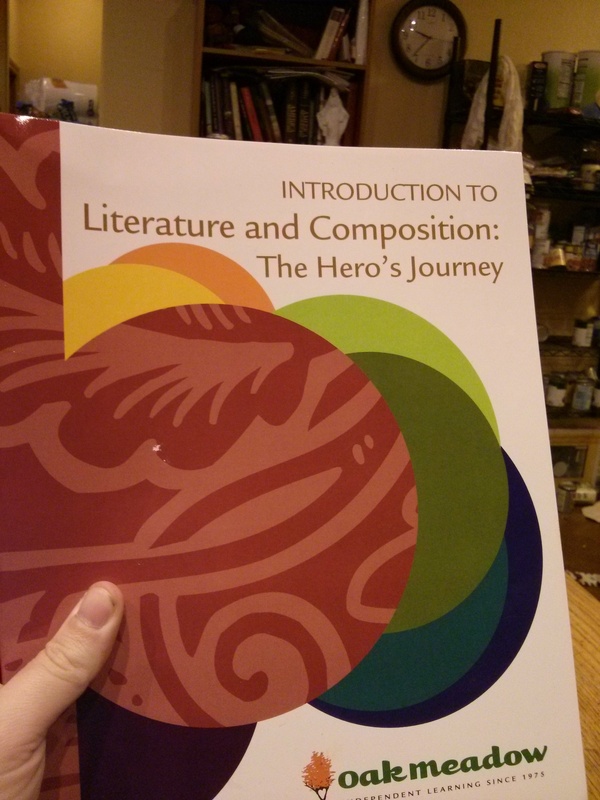 The Hero’s Journey, a freshman/sophomore English. It’ll be spiff! I need to get the texts to go with it though. Oak Meadow offers them as a package deal but I can get them cheaper if I dig around. I’ve ordered the first two books they’ll need, House of Light, by Mary Oliver and The House of the Scorpion, by Nancy Farmer. If they just loathe it I’ll be out a few bucks, not $75. The program calls for a journal as well, for which I have ordered these sketch diaries. We’ve bought these before for the little kids to use for sketchbooks. They are nice, sturdy sketchbooks and will suffice for the girls to journal in. Faith is quite particular about her artist sketchbooks, but I think she will tolerate these for an all-purpose journal. Now I need to decide if I want to use Oak Meadow for Gilbert and Trixie. I’m leaning toward OM Year Four, but it’s (ugh!) over four hundred dollars. Now, that’s for every subject, and I’d use it with two kids. So, not entirely awful, just a big expense to begin with. But then there’s Gloria, who can’t be shoehorned in with Gil and Trix, and probably would benefit the most from OM Year One. Another $300+. Youch! I can see why people use virtual charter schools with a curriculum allowance. I’m just not yet willing to part with my educational independence for filthy lucre. Posted in thoughtsTagged homeschooling, oak meadow, TANSTAAFL, unschooling, virtual charter schoolLeave a Comment on High tide ahead – The Hero’s Journey, perhaps more? we r reel homskoolurs nao! 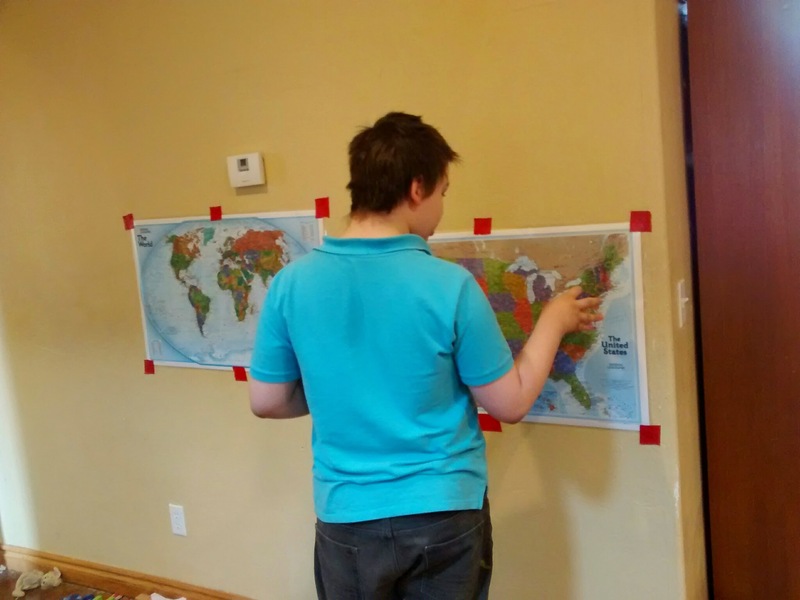 Homeschoolers always have a map on the wall. We haven’t put one up in this particular house… until this morning! I realized a while back that some of my kids have no concept of nonlocal distance or political boundaries (or time, beyond an hour or less, but that’s for another day.) Homeschooling for so many years and so many ages means getting to do things again and again. Faith and Abby went through this years ago, and Bede, but now Gilbert, Trixie and Gloria are getting up to speed. So I bought us a couple maps: a world map and a United States map. They’re both laminated, so I also got some Vis-a-Vis wet erase markers – the kind teachers use on overhead transparency film. The plastic is very smooth and will make using the markers a breeze. They’re good maps. The world map is the same size as the US map, which makes it a little small in my opinion, but the US map is about right. Above, Bede telling me where New York is. Doesn’t the red duct tape just make the whole thing pop! Ha, ha. I’ll put it up with a better method; this was just because the kids wanted them up today, now, this very minute. Those show the scale pretty well, I think. Bede is the size of a smallish adult. The map purchase necessitated deciding what projection I wanted. Now, I favor the Robinson projection (no surprise there!) but this one is Winkel-Tripel, which is okay, I guess. (squints) It will do for now. Posted in thoughtsTagged homeschooling, map, xkcdLeave a Comment on we r reel homskoolurs nao!